Sputnik: Do you think that Trump will actually keep his word regarding the acceleration of tariffication against Chinese products? Prof. Kerry Brown: Yes, I think he will because he does not have much political space to back down. There is sort of logic in what he's doing because there is nonpartisan support for it in America, one of the very few things that probably does have nonpartisan support, Democrats and Republicans seem to be linked up on this desire to kind of get tougher on China and the narrative of China being an unfair trade practitioner has gotten into peoples heads, whether that's true or not, that's the perception, so, I think electorally in order to, kind of, at least build some consensus and because he is keeping his promise unless China changes, it's pretty inevitable that he'll do it. He's already kept his promise on other things he would do in this space, so, I think it's likely to happen than not happen, unless China responds in some way. Sputnik: Donald Trump in an interview with the Wall Street Journal said it was highly unlikely that he would accept a request by China to stand down on his plans to ratchet up those tariffs. This is a very, very aggressive stance, is this part of his deal-making strategy with China? Do you think there's any chance that this will see any kind of prelude to a deal during this meeting with Xi Jinping? Prof. Kerry Brown: For Trump, there's no kind of bad outcome to this in a way, whatever the terrible economic impact might eventually be. Economists don't seem to agree but most seem to say there will be a negative outcome for everyone. For Trump, first of all, his base is obviously kind of impressed by the fact that he's standing up to what he sees as America's biggest competitor, in addition to that, if he does a deal when he meets Xi Jinping he's a hero because he's done a deal and no one else was able to do that he will say, if he doesn't do a deal that's because the Chinese are not being reasonable and they're kind of doing what they should do and he still looks a hero. So this is a kind of almost like an inevitable clash and I guess the real key issue is how does China respond. Does China do something which is so bold and generous, and kind of breaks this circuit in ways where they can also come out of it looking like they're also heroes, or are we just going to see a kind of stalemate at the moment, it's hard to say. At the moment you can say that the impact of these tariffs on China looks to be more severe, it's looking to be more of a political problem for Xi Jinping then for Trump, which wasn't what was expected a few months ago. This is really problematic for the Xi presidency, they had less space than we thought, and there's a kind of anxiety, I suppose, on the Chinese side that we're seeing that might disappear, but it might be very significant, it might be kind of a big, big challenge for China that it's got to do something about, and Xi Jinping presidency, Xi's leadership of China could be defined by how he really deals with this issue. Sputnik: Can you please comment on what impact it is going to have on the US economy? I think that most economically literate people feel like there's no winners in a trade war anyway, and certainly 2% losses on stock values for Apple, other companies I can imagine are also suffering from this. I don't think Amazon is going to be doing wonderfully as well with an increase of tariffs on consumer goods that are shipped to the US. Prof. Kerry Brown: So what is this really about? Is it really about trade flows or is it about something bigger? I mean, if it's really about trade I guess we would say you could see a pragmatic deal, there would be some way of sorting this out, but, in fact, I think it's a bigger issue. 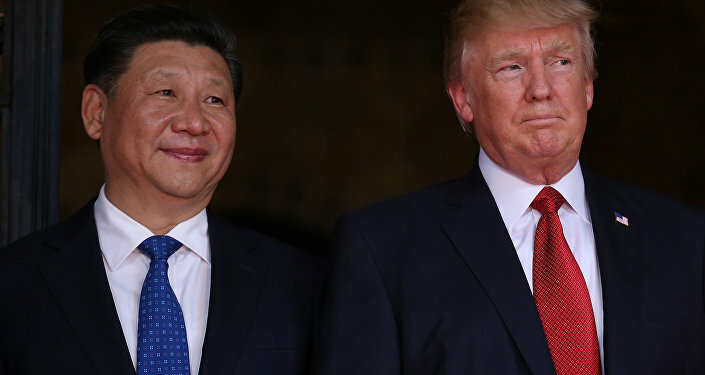 It's about a highly competitive relationship between the world‘s number one and number two, in which the world's current number one — America — is looking jealously and nervously at a China which is progressing far faster than anyone ever expected, including Chinese. I don't think they thought they were going to hit this moment for another decade or so, so it's really a preemptive strike by America and their greatest geopolitical competitor. Is that really easy to resolve? And will it be resolved in the way that they're currently doing it? I think this is a skirmish with a greater kind of issue hovering over it, which is can a number two economy and a number two geopolitical competitor with a very different set of values and a very different vision of the world really be accommodated in a kind of worldview the Americans have constructed and which they really feel should be universal. This is a huge, huge issue and so they may do a pragmatic deal, maybe in the next sort week or so, or even the next few months. Maybe the economic hurt in America may cause a change, maybe, but that big structural issue does not go away. It will not go away with any kind of pragmatic deal on this level because the bottom line, I think, is this is part of a long-term structural competitive clash between America and China which has been there for a decade or so, and it's going to continue and intensify into the future. I guess the final thing you have to say on that is that you can't really expect the Chinese people to put away their aspirations, their desire to be a great nation and do all the things that Xi Jinping said he will do for the Chinese people, just because the behest of another power says you put your expectations away and just stay in your place. So, this is not an easy issue, which is why it's not going to be an easy issue to resolve, not at all.